I don't remember my parents making a lot of non-Filipino food when I was growing up. There was the occasional spaghetti -- a jar of Ragu simmered with finely chopped onions, celery and ground beef. We'd sprinkle buttered toast with garlic powder and bam! Italian night. Or my dad would make steak and fried rice, or sometimes mashed potatoes. Then there was this dish that my mom made just for me, a package of frozen meatballs heated in a mixture of barbecue sauce, ketchup and onions, which I'd eat over white rice. I loved that stuff. I'd still eat that stuff. But there was no meatloaf, or chicken pot pies, or biscuits and gravy. For me, traditional American comfort food came already prepared in cans, boxes and microwavable containers. Canned soup. Kraft macaroni and cheese. Budget Gourmet frozen dinners: Swedish meatballs, beef stroganoff, Salisbury steak with veggies. I'd eat them on the floor in front of the TV in my parents' room and wonder what it would be like if every meal included a side of peas rather than white rice. If there was ketchup on the table instead of shrimp paste. I wasn't ungrateful for the food my parents made -- I loved Filipino food. Lumpia, pancit, adobo. But when you're young, and all your friends and the people on TV are eating certain kinds of food, you kind of wish you could be like them, too. At least just some of the time. My favorite canned soup was Campbell's Chunky Split Pea and Ham. I'd heat it up until it was scalding hot, then burn my tongue on the first few bites every time. (To this day, I still eat my soup like this.) But unlike my precious packaged ramen noodles that you could never ever convince me to give up, despite its empty calories and outrageous sodium content and general icky processed food stigma, I haven't had a can of split pea and ham soup in years. In fact, the last time I remember buying it, I was in college, standing in the grocery store aisle with my new boyfriend/future husband, sneaking it into the cart and hoping he wouldn't break up with me out of disgust when he saw it. 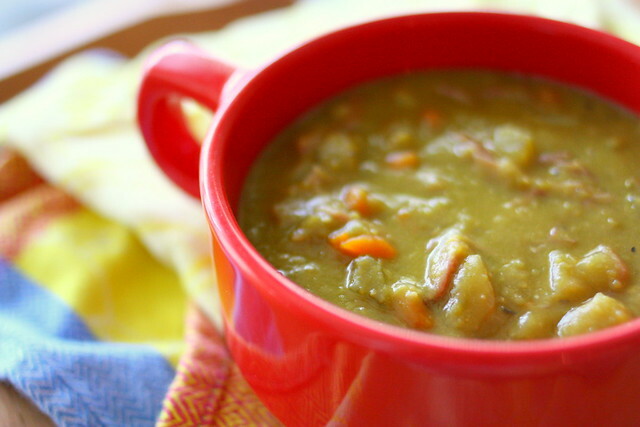 The reason for the end of canned split pea soup in my life is, of course, that homemade is just so much better. Especially when you can get your hands on the ham bone from Christmas or Easter dinner, although good luck with that one if you didn't bake the ham yourself. No one wants to give up that ham bone. Believe me, I've asked. Even my own parents, who always insist I take food home whenever I visit, get very quiet when I ask them for the ham bone. They know what kind of soup it makes, and I don't blame them for refusing to give it up. This soup gets very thick over time, so when reheating, just add a bit more water until it's the consistency you like. And Speaking of my parents and ham bones, they actually asked me to make this soup over Christmas with the bone they had frozen from Thanksgiving. So if you're willing to share the soup, you might find someone willing to share the ham bone. Also, can you believe that photo up there has been sitting in my Flickr stream for over a year now, just waiting patiently to be posted on the blog? I need to get better at this, clearly. Layer ingredients in slow cooker in the order given, adding the broth and water last. Do not stir ingredients. Cover and cook on low 8 to 10 hours, until peas are very soft and ham falls off the bone. Remove bone from slow cooker. Shred ham using a fork, discard bone and return meat to slow cooker. Stir and serve. It's so true that kids want to be like the people around them (at least, it was true for me). You just want to fit in, be normal. It's something I wonder about for my imaginary future children---Tim and I eat different and we live a different schedule and the things we find interesting are so different than the average person---my kids will probably hate me for it, at least for a while. Adolescence is tough. Hopefully it comes full circle by the time they're adults though and they like their parents like I like mine and you like yours. Hopefully also I'm willing to jump on board with good ideas once in a while. Phew tangent over! Hooray for more crockpot meals! Hooray for getting to hear from you this morning! The thing is, I didn't even fully realize how differently I grew up eating until college, when I started living with other people and noticed that my eating habits weren't the same. Now, I think that growing up with Filipino food is one of the reasons why I'm not at all a picky eater, and for that, I'm so grateful. i remember vividly a conversation with a friend about what she had for dinner. i had vietnamese food for dinner every.single.night. my friend told me she had ham for dinner and my only ever interaction with ham was the packaged stuff for sandwiches and i thought that that was what she had. like, her mom opened the package, slapped a slice of deli ham on her plate and called it dinner. i thought it was so weird and I WANTED IT. I love this story, Jacqui :) The part about your parents being hesitant about giving up the hambone is hilarious! My Dad's sister's husband is Filipino and knowing about the delicious food I've enjoyed at her home makes me jealous you grew up eating it often. But it's human nature to crave what you don't have sometimes. I actually popped over here because in the deep recesses of my mind I remember your family's chicken adobo recipe. Must pin it to try soon, so I don't forget, again! Oh, I hope you try adobo! It's so easy, and every time I make it, I tell myself I need to make it even more. Thanks for dropping by! I'm half Filipina and I relate completely to your story! Now that I'm away in college, I miss my mom's filipino cooking so much. Thank you for this recipe - my Aunt actually makes a soup very similar to this and I was looking everywhere for the recipe. It's delicious! Just to update, the soup came out delicious. I'll be making this again and again. Do you soak the peas overnight or just toss in the crock pot after rinsing?